Fredericks & Freiser is pleased to announce the first solo exhibition of Mark Thomas Gibson. Gibson’s practice includes black-on-black image paintings as well as large-scale works on paper made with paint, glitter, and acrylic spray. In Mark Thomas Gibson’s work, our perception of history is our curse. His work posits that there is no one truth to be found in our shared past, despite our collective understanding of books and image archives. 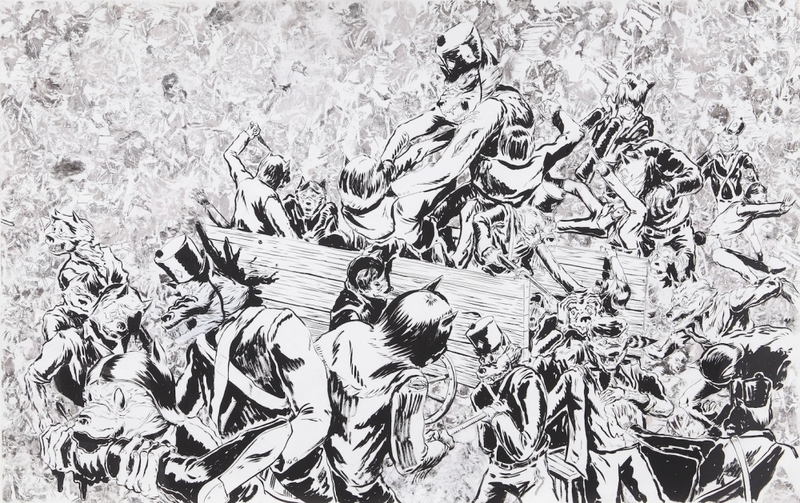 In his most recent paintings and drawings, Gibson navigates the popular narrative of the Alamo to dissect the truths that were once thought to be self-evident. Gibson’s black-on-black paintings implement a process of paint distillation (taking a given image and distilling it for its most basic and fundamental properties), directly mirroring his distillation of historical facts. Complex events in history are often reduced to a series of heroes and villains. Gibson rejects this simplicity and aggrandizement as the “birthplace of our curse.” Instead, he riffs on significant history paintings to produce a fiction that subverts the so-called truth of the past. To achieve this, Gibson takes rather macabre liberties. He replaces the image of Davy Crockett with an anthropomorphized wolf. He depicts Andrew Jackson dancing wildly to conjure a cosmic lightening storm that consumes the Alamo. Gibson’s strategies borrow equally from Southern Gothic literature and comic book phantasmagoria and beg the question: what is our truth and who determines it? Thomas Gibson (b. 1980, Miami, Florida) received his BFA at The Cooper Union in 1998. In 2013, Gibson received his MFA in Painting & Printmaking at Yale School of Art and was the recipient of the 2013 Ely Harwood Schless Memorial Fund Award. Recent exhibitions include Black and Blue, Motus Fort Gallery, Tokyo, Japan, (2013), Blane De St. Croix, Mark Thomas Gibson, Howardena Pindell, Fredericks and Freiser, New York, (2013), and Space, North Atlantic Conference Exhibition, New York, (2012). Gibson lives and works in Brooklyn, New York.